Can’t Help Falling in Love is a very popular song made famous by Elvis, and it’s a great beginner guitar song you can learn today! There are just a few harder chords involved, which probably will give you a headache at first, but I promise you, keep at it and practice them for a couple of weeks, and you will get them down for good. The song basically consists of 2 main parts, therefore our Can’t Help Falling in Love guitar lesson can be split into 2 main parts as well. You’ll be using arpeggiated chords all throughout the song, so first of all, we’ll be learning the chords. As I said, Can’t Help Falling in Love has a couple of chords that will give you a run for your money, but it is possible, so keep at it. Once you learn the chords, we’ll move into learning the picking pattern you’ll be using throughout the song. 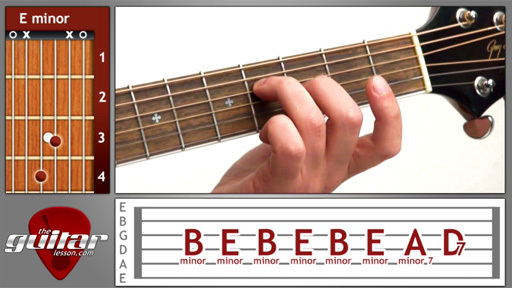 Keep in mind that your thumb always plucks the lowest string in any given chord in this song. Now I teach this song in 4/4 time, meaning there are 4 beats to a measure. However, theoriginal song is played in 6/4 time, meaning that it has 6 beats to a measure. The reason I decided to go with 4/4 is that most beginners find dealing with 4/4 time easier, since 80% of songs are in 4/4 time, but if you want, you can play it in 6/4, just listen to the original recording and you’ll hear the difference. You’ll basically have to play faster to keep rhythm, and pluck 2 extra notes of the chord you are playing. So getting back to the lesson overview, once you learn the picking pattern for Can’t Help Falling in Love, you’ll apply it to the chord progression used in the song. At this stage, you should be familiar with most of the chords already, so perfecting this song will be directly correlated with how fast you can change chords, making this song a very useful one if you need to advance your chord changing skills. Can’t Help Falling in Love was released by Elvis Presley in 1961 on the album Blue Hawaii (and featured in the film as well). The song is actually based on the song Plaisir d’Amour, written in 1780 by French composer Jean Paul Égide Martini. The song topped the charts in several countries, and was covered by a large number of artists (UB 40, Bob Dylan, Bono from U2, Pearl Jam, Bon Jovi, etc.) and used in a number of movies as well. Sorry, but you've reached a premium content area. The download of the Can’t Help Falling in Love tablature file is only available to premium members. Sorry, the same goes for the backing track. To download the backing track to Can’t Help Falling in Love, please log in and revisit this page.